One thing I love about teaching prenatal yoga is the opportunity to correct a lot of the scary misinformation out there about pregnancy and birth. So many moms come to my classes worried that the simplest activity or one bite of the wrong food will spell serious disaster for their babies. I back up the information I give with research whenever possible and I share in their visible relief when they find out they can still do/ eat/ enjoy the vast majority of the things they love. 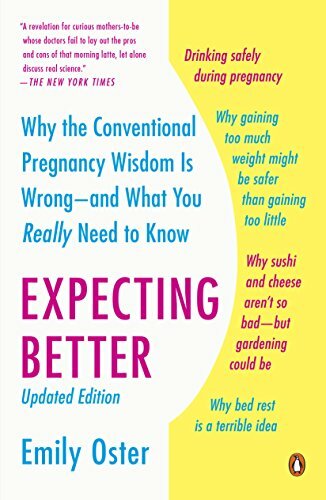 When one of my students recently mentioned Expecting Better by Emily Oster, I knew it was time to jump into this book I had come across numerous times in googling research to support breaking down the misinformation. Thanks to a Little Free Library, I already had a copy waiting by my bed! Halfway into the book, I was singing its praises! First and foremost, I could not agree more with Oster’s philosophy on pregnancy decision making: “This book is very specifically not about making recommendations; it’s about acknowledging that if you have the right information you can make the right decision for yourself.” That is exactly what I strive for with my students- there is no one right way to manage a pregnancy, no one right way to give birth, and no one right way to parent. My goal is to supply students with factual and appropriate information and encourage them to have ownership in the decision making process. So for this reason alone, I recommend Oster’s book. She does well at presenting research on a number of topics that every pregnant woman has been on the receiving end of well-meaning and often misguided caution: drinking coffee, consuming alcohol, changing the kitty litter, and exercising. The book also compares common medical practice to research in regards to prenatal testing, epidurals, induction, bedrest, place of birth, and more. None of the research she presents is incorrect. However, there are a few arguments she makes which fall short. Oster is admittedly an economist- it is the inspiration for her book, as she explains how she used the tools of an economist in analyzing the data to make decisions in her own pregnancy. But I suspect that because she is not a “birth person,” an anatomist, or medical professional, she doesn’t know what she doesn’t know, and doesn’t have the lens to see the bigger picture. My biggest disappointment was the three pages on kegels. She is not wrong that research shows that groups of pregnant women who did kegels had less urinary incontinence than those who did not. However, there is so much more to the health of the pelvic floor than incontinence during (and immediately after) pregnancy. Research is unfortunately lacking on the subject, but authorities such as Leslie Howard and Katy Bowman have both spent their careers exploring the way the body works for the health of the pelvic floor. They encourage a much more comprehensive, whole-body approach for long-term pelvic health and their work informs the sequencing of my classes. There were a few other examples of Oster lacking the background to see the bigger picture. For example, in her discussion of home birth, she states that some studies indicate that up to 30% of first-time mothers planning a home delivery end up transferring and a home to hospital transfer would be more inconvenient than just planning your birth at the hospital in the first place. In my experience, mothers who transfer from home to hospital feel more confident in the necessity for medical care in their births compared to women who planned an unmedicated hospital birth and ended up with interventions they did not initially want, like epidural or cesarean. The latter are often left wondering if the hospital management of their care did not allow for things to unfold the way they had hoped, with one intervention cascading into more. That alone may make planning to birth at home worth it. In regards to delayed cord clamping, Oster notes that in full term babies the increased risk of jaundice is equal to the decreased risk of anemia due to higher levels of iron transfer. Many birth professionals have been questioning the pathology of jaundice. In other words, recent research is examining if newborn jaundice is actually in the range of normal, serving the purpose of safeguarding newborns against sepsis. If this is indeed the case, it is no longer an issue of half dozen of one, six of the other. My criticisms of Oster’s book are too few for me to not recommend it. In fact, I felt the information she provides is relevant enough to add it to the required reading list for Lotus Blossom Prenatal Yoga Teacher Training- it contains enough quality analysis of research for prenatal yoga teachers to support their students in informed decision making. That said, I do encourage anyone who reads the book to use it as a starting place and to seek further information to fill in the gaps in which Oster falls short. It’s a great way to get the conversation started between moms and their health care providers. Ultimately, it’s up to mom to analyze the available data and make her own decisions- which is exactly Oster’s point!